The Jack C. Montgomery VA Medical Center in Muskogee. A 23-year-old female veteran who had been raped in the Army is discharged from the psychiatric ward at the U.S. Department of Veterans Affairs hospital in Muskogee without anyone notifying her family – despite a safety plan that required that her mother, sister and stepfather be informed of her regimen of care. She commits suicide. At the VA hospital in Oklahoma City, a veteran chokes to death on the contents of his stomach after he receives anesthesia for surgery. At the same hospital, another veteran dies of an infection less than one day after he is discharged following colon surgery. See map with details on Oklahoma cases. These are some of the deaths that resulted in more than $200 million in wrongful death case payments by the Department of Veterans Affairs in the decade after 9/11, according to VA data obtained by The Center for Investigative Reporting. In that time, CIR found the agency made wrongful-death case payments to nearly 1,000 grieving families, including 29 in Oklahoma, ranging from decorated Iraq War veterans who shot or hanged themselves after being turned away from mental health treatment, to Vietnam veterans whose cancerous tumors were identified but allowed to grow, to missed diagnoses, botched surgeries and fatal neglect of elderly veterans. In most of the cases, the VA did not admit wrongdoing but paid survivors in an out-of-court settlement. “It wasn’t about the money, I just thought somebody should be held accountable,” said 86-year-old Doris Street, who received a $135,000 settlement in 2010 as compensation for the 2008 death of her brother, Carl Glaze. The median payment in VA wrongful-death cases was $150,000. Glaze, a World War II veteran, became paralyzed from the neck down when he fell in the bathroom two days after being admitted to a VA nursing home in Grand Island, Neb. He died nine days later at age 84. In a written response to questions, agency spokeswoman Victoria Dillon said that while “any adverse incident for a veteran within our care is one too many,” the wrongful deaths identified by CIR represented a small fraction of the more than 6 million veterans who seek care from the agency every year. The agency, Dillon said, is “committed to continuous improvement.” When a death occurs, “we conduct a thorough review to understand what happened, prevent similar incidents in the future, and share lessons learned across the system,” she said. The revelations come as the department faces intense scrutiny from members of Congress over the number of preventable deaths at VA facilities. The House Committee on Veterans’ Affairs has scheduled a hearing on preventable deaths for Wednesday. In September, the committee held a hearing to examine patient deaths at VA hospitals in Pittsburgh, Atlanta, Dallas and Jackson, Miss. At the hearing, lawmakers accused the agency of failing to discipline officials responsible for unnecessary deaths, pointing out that it has instead provided performance bonuses to these executives. For example, after an outbreak of Legionnaires’ disease at the agency’s hospital in Pittsburgh left six veterans dead and at least 21 ill, the VA regional director, Michael Moreland, received a nearly $63,000 bonus. A five-page performance evaluation, which led to the bonus, made no mention of the outbreak, which began in 2011. After receiving the bonus, Moreland retired. At a budget hearing March 13, lawmakers pressed Secretary of Veterans Affairs Eric Shinseki to provide examples of agency staff who had been disciplined after medical errors resulted in a veteran’s death. Shinseki responded more generally, saying 6,000 VA employees had been “involuntarily removed” over the past two years, including six senior managers. Independent legal analysts say the nearly 1,000 wrongful-death case payments in the decade after 9/11 represent a small percentage of the veterans who have died because of malpractice by the Department of Veterans Affairs. Unlike the private sector, where survivors can file cases in state and federal court and often win large punitive damages, families of patients who die under VA care must exhaust a months-long administrative review process before filing a lawsuit. Even if they succeed, families can win only actual and not punitive damages from the federal government. As a result, lawyers are reluctant to take cases, and many families never file or get damage payments. “The VA fights every case tooth and nail, and so cases drag on for years,” said Cristobal Bonifaz, a Massachusetts attorney who in 2009 won a $350,000 settlement for the parents of Marine Lance Cpl. Jeffrey Lucey. Lucey was 23 when he hanged himself with a garden hose in his parents’ basement after being turned away from psychiatric care at the VA in Northampton, Mass. The payout came five years after his death. Among Bonifaz’s current clients is Tracy Eiswert, who had moved into her car with her two young children after her husband, 31-year-old Iraq War veteran Scott Eiswert, shot himself in the head in 2008. The Nashville, Tenn., VA had denied his disability claim for post-traumatic stress disorder. Three months after his death, the VA reversed itself, saying it was “clearly and unmistakably in error” for failing to grant Scott Eiswert’s disability claim, and the agency began sending Tracy Eiswert survivor benefits checks of $1,195 a month. Despite the reversal, Tracy Eiswert decided to press ahead with a wrongful death lawsuit against the VA, in part because of the toll her husband’s suicide took on their children. “We’re still living with it today,” she said. The VA declined to comment on Scott Eiswert’s death. In court, the VA has defended itself on a legal technicality, arguing that Tennessee law supersedes federal law in the case and that the Eiswert family failed to follow procedures prescribed in the state statute. Filed in 2010, the case is still pending. In Oklahoma, data obtained by CIR shows that in 23 wrongful-death cases filed in the decade after 9/11 related to the VA hospital in Oklahoma City, the VA paid out more than $3.6 million to families. 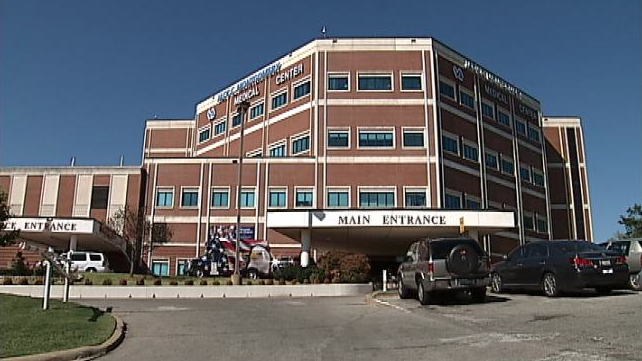 In six cases filed during that decade related to the VA center in Muskogee, the VA paid out more than $715,000 to families. At both facilities, allegations included failure to treat, diagnose or monitor; using improper techniques or wrong procedures, and failure or delay in admission or referral. CIR intern Nicholas B. Hirsch contributed to this story. It was produced by The Center for Investigative Reporting, an independent, nonprofit newsroom in the San Francisco Bay Area. For more, visit cironline.org/veterans. Glantz can be reached at aglantz@cironline.org.